PR Power supplied a back-up generator solution to PLE Computers’ Wangara head office. PLE Computers, an IT solutions provider for WA businesses and consumers in Wangara reviewed a number of options before selecting the PR22P-SAE model from PR Power’s range of diesel generators. Anthony Hollingsworth – BDM at PLE Computers explains that the PR Power generator solution was selected based on key criteria including their ability to provide a complete product offering of supply, installation and service as well as their high level of expertise in supplying generators Australia wide. PLE Computers found a long term business partner in PR Power that would ensure business continuity even during power interruptions. The generator proved its worth in less than two weeks after installation during a major power outage in the early hours of the morning in the Wangara business area. Mr Hollingsworth received an email alert sent from the genset informing him that it had been powering their Wangara Head Office since 1.45am. PLE Computers was able to function without any interruption, while businesses around them simply had to close for the day. 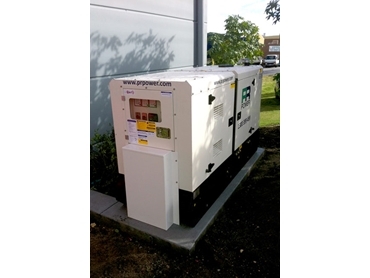 The PR22P-SAE genset operated uninterrupted for 13 hours until power was restored to the area. Mr Hollingsworth adds that the power back-up prevented the company from losing up to $40K in sales and wages, making the decision to install a generator a worthwhile long term investment for their business.